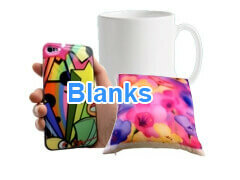 Subli UK - Sublimation Blanks, Wholesale Supply. Same Day Dispatch! Sublimation Blanks, Inks & Paper. 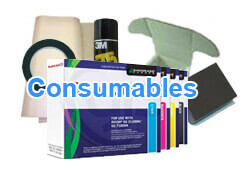 Dye Sublimation Printers, Heat Presses, Blank Mugs & Many Other Dye Sub Products. Looking for wholesale suppliers of blank dye sublimation mugs? Look no further. As well as a wide range of other dye sublimation products including sublimation ink, paper, printers, heat presses and mug presses, we offer a fantastic range of blank dye sublimation mugs . Including Orca coated Durham, Rhino coated Wycome, balmoral bone china, large balmoral bone china, Orca coated Birmingham, Orca coated Cambridge, Sparta, Wow mugs, black mugs with white patch, espresso / childrens mugs, spoon mugs, cup & saucer sets and much more! New to sublimation printing? See our help guide: Sublimation printing, how to & why to. We have good stocks, especially with the orca Durham and Rhino Wycombe mugs, so it is rare that we are out of stock of these mugs - we know how annoying it is when you can't get hold of your best selling products! 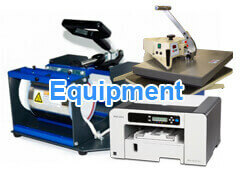 Large Range of Heat Presses & other Dye Sublimation Equipment. We supply Stahls Hotronix heat presses, Transmatic & George Knight Heat Transfer Presses. We stock all sublimation supplies, including Sawgrass VisiJet / SubliJet dye sublimation inks, Ricoh A4 and A3 dye sublimation printers. Trupix dye sublimation paper (Sheets and Rolls), Texprint R (specialist Ricoh paper) and Texprint HR (in sheets and roll including wide format). We supply 66m rolls of 3M green heat transfer tape (for just £2.99 per roll!) Teflon sheets in a wide range of sizes at very competitive prices, and our smashproox mug shipping boxes are increasingly popular as a secure method of mug packaging, which double as a gift box. We have a great range of blank sublimation imprintables including cushions and tea towels, Aprons, Bibs, Bags, Wallets, Ties, Scarves, iPhone cases, Samsung cases, Blackberry cases, glass photo frames and other glass blanks, high quality chunky metal keyrings, aluminium blanks including business cards, fridge magnets, id tags and bookmarks. The JelliSkin range, Wooden coasters (including Unisub), jigsaw puzzles, placemats and other wooden blank products. Subli slate / rock, laptop pouches, 3D blanks, money banks, water bottles, ceramic tiles... and an ever growing list of high quality blank imprintables. What's more, we have a lot of experience in looking after trade customers, having been in the printing industry since 1972, and we have the necessary experience, expertise, staff & resources to offer a great, dependable service and competitive pricing. We are predominantly an online dye sublimation blanks supplier, and we are best equipped to supply and support customers via our website and via telephone. We are great at getting orders out on time, we offer great telephone and email support, but we are not geared up for site visits or demonstrations, or for impromptu visits to place orders. If you would like to collect your order from us, please order online, and select "collecting" (so that delivery is not charged for) and let us know via the customer comments box, roughly when you will be collecting your order. Please give us at least an hour or two to pick your order, or if you're in a rush to collect please give us a call first before setting off. Please note our lunch hour is 12.30 - 1.30. If you have any questions, please do not hesitate to contact us, either by telephone on 01625 876949 - or via email.